The seeds are cold-pressed to retrieve this light yellow oil that is loaded with vitamins and essential fatty acids that help to renew the skin’s elasticity. Wonderful for mature, acne-prone, oily, and dry skin. Ingredients: 100% Pure African Kalahari (Watermelon Seed) Oil and a touch of fragrance. Our Pure Kalahari Melon Seed (Watermelon Seed) Oil is sourced from Africa. 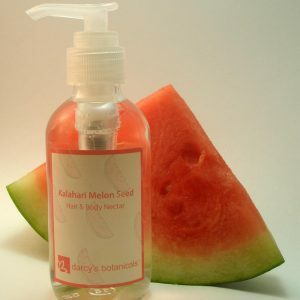 Watermelon Seed Oil is also know as Kalahari Melon, and Ootanga Oil in Africa.